As my daughters delight in pointing out, I am not the sharpest knife in the drawer. But after a while, even a dull knife sometimes gets the point. I have been noticing that, every time we go bike riding, it’s windy out. In fact, it has been frustrating me. Sometimes, it is genuinely windy. Yesterday, for example, it was so windy that we had to pedal to go downhill. Meanwhile, once the wind was behind us, we were able to coast uphill; we didn’t have to pedal at all. You believe me, don’t you? Back on topic: it finally dawned on me today — about the wind that is. It happened when we stopped for lunch. As soon as we got off the bikes, the wind died down to a gentle breeze. Eureka! When you pedal, you’re really always pedalling against the wind. Even if the true wind is behind you, blowing at (say) 5 kph, if you are pedalling at 20 kph, then it’s still like you are pedalling into a 15 kph wind. It took me over two months to get that. Not the sharpest knife indeed! So what? Well, it strikes me that this is parable-like. It’s really true about life and all that we do in life. The harder that you pedal (i.e. strive for excellence), the harder the going gets; the winds of adversity pick up their heads and blow right into your face. You can coast to a C, or maybe even a B, but you can’t coast to an A (not most of us anyway). You might be able do a satisfactory job without expending too much energy, but it takes a lot of effort to be a great employee. It’s easy to cut back on dessert for a day or two, but it takes planning and commitment to succeed in a long-term and enduring life-style change. It’s easy to get on the bike and enjoy a leisurely pedal around the block, but it’s hard to be out on the trail, pumping your legs for two hours. But you know, I always feel better once I get home. I think we all feel better when we make up our minds to do something really well and then put our hearts into it. We all need to strive for excellence in some area of our lives. We need to get out and pedal against the wind. It’s hard work, but, eventually, it feels really good. I don’t love filing and sorting papers. I dreaded the sorting that accompanied every year-end when I was teaching. Sorting and filing, to me, are mind-numbingly fatiguing tasks. Of course, I didn’t make it any easier by playing Mr Environmentally Friendly. I would try to sort the recyclables from the trash, even to the point of pulling out staples or at least tearing off the corners with the staples. So it was that last week found me doing the same chore at home. Only this time I was wading through four crammed file drawers. Good grief, I found material that was over thirty years old. I went through every folder, separating the transparencies from the paper and then pulling out the staples. Needless to point out, I, most emphatically, did not enjoy the time of my life. Every box that you see in the photos to the left is full of paper or file folders. 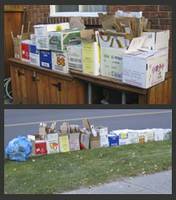 The top photo shows the boxes stacked by the house. We waited until the last minute to put all of this paper out for pick-up because we thought that it might tempt certain juveniles to have a paper-tossing party if we left it out all night. Can you imagine the mess?! In neither picture does it look like the mountain that it felt like, but it was an enervating job for me. I can sit at the computer for hours — coding, imaging, or writing — but ten minutes of this kind of sorting knackers me. I promise never again to get into this sort of mess … until next time. We biked down there on Thursday: a wonderful, halcyon, summer day. Yes, technically, autumn had already begun, but, weather-wise, it was as fine a summer day as one could wish for. The water was deep blue; sailboats and motorboats idled by; an old-fashioned schooner glided gracefully upriver; and, seagulls hovered in great expectancy of castaway fries. A pretty darn perfect day! These fries, or chips, are delightful, and, of course, they are made more so by the ambience of all that I described above. Generally you place your order and wait. You can often hear them slicing the fresh potatoes, dropping them into wire baskets, and lowering them into cauldrons of bubbling grease. The pieces all float separately and freely in this old-fashioned, English way of "doing chips." Being Canadian, we normally have our fries with vinegar. It is strange that they don’t do that Stateside. I can almost throw a chip across the river, but culture does change at the border. They talk differently over there, more accented really. They tend to drink soda while we drink pop, and so on. But two large flags fly on both sides of the border: one American and one Canadian. We are two distinct nations that squabble a bit every now and then, but we are two pretty good friends and neighbours too. The fries were great! This was our final indulgence of the summer: our last fries rite. We needed one more fix before fall and winter set in. Despite the fact that we have been pretty good about not indulging very often this season, I felt a few tiny twinges of guilt about eating these greasy, artery-clogging morsels. But I quickly got over it and simply yielded to the delight of the moment. Sometimes you need to loosen up, but you also need to run a tight ship most of the time in order to really appreciate the little treats that help to make life worth the living. We chanced upon a memorial service when we biked to the wetlands today. Over the past fifteen years or so, four thousand, memorial trees have been planted there. Once a year, many gather for a memorial service. What a great way to remember loved ones. When we are young, old age and death seem so far away — almost forever. The life that stretches before seems so long that we almost feel immortal. One day that changes. I can remember when it changed for me. Picture me: almost forty, strolling through a little village with wife and children. Wife decides to take the kids into the cemetery because they (cemetaries not kids) are always interesting. At that moment, I wanted no part of it, for I was suddenly smacked with the realization that it really wouldn’t really be long until I, too, rested in a place like that. What a disturbing revelation! I was mortal; my life was half over already. I was not ecstatic. Since then, all of our parents have passed on, some far too young. A young niece of five died suddenly from a lurking but undetected virus. My wife had a cancer scare last year. My sister-in-law had one this year. They both escaped — this time! — but the grim reaper sharpens his scythe for all of us, and he may not be as far away as we all wish. When we are of an age to face the death of a parent, and when there are departures and close encounters in our families, we can’t help but ponder life … and death. My pondering has led me to at least one conclusion. You must understand that this is my belief only. It may not be held by anyone else on this planet. The duration of our lives is not nearly as important as the quality of our lives. In fact, contrary to most people, I believe that duration is not terribly important at all. I believe that lives, whether short or long in years, more or less seem the same length to everyone. Now nearing sixty, I don’t have any real sense now of having lived longer than I had twenty, thirty, or perhaps even forty years ago. How ever old I live to be, it will all seem like a blur. In a sense it will seem like a mere moment, and in another sense it will seem like forever, for I have been present for all of my life, and my life is my forever. You know what? All that we have is the here and now. You and I have this moment. Then, we may have another moment. But our life consists of these present moments. We have to grasp life in the present because, if I’m right, and of course I am, it’s all we have. We must make the most of each moment. That’s hard, impossible really. There will be bad moments. So, we must make the most of the most possible moments that we possibly can. We need to relish the little things that we do today. The true joys of life are not about the big trips that we take, as nice as they are. If you think that real living is about the big trip, then what are you doing for fifty weeks a year? Not living? Spending more than ninety-five percent of your time not living? Can I suggest that the best things of life are really: hugs, greetings, smiles, nice days, nasty days outside when you’re somewhere inside, kids, pets, parents, children, work-talk, being friendly, enjoying a coffee. This is what we do! We do these things all of the time! This is life. This is living. Proactively embrace and enjoy this daily minutia. If you absolutely can’t, then you must change something: location, job, how you use your leisure time, or maybe your attitude. I suppose this needs to be a book. As a blog, it’s getting long. You need to move on. So, let me wrap up. What a great idea to plant a tree in memory of a loved one. Me? When it’s my time, I want to be under that tree. Even if it’s my ashes in the planting hole, that’s where I want to be. I will be part of the ground and part of the tree. We are all immortal you know. Did you know that? Our stuff will change form, but it will go on in some form until the end of it all. I think it would be nice to spend my first century or two of immortality as part of a tree. I hope that I’m in a spot where I eventually fall and from my crumbling hulk a new tree takes root. Less you have misunderstood. I don’t eagerly seek or embrace death. I acknowledge it, and that compels me to embrace the moment. Being human, I don’t embrace them all, but I sure try to find satisfaction in what it is that I do with as many moments as possible. Moments are life. Life is made up of moments. Your life is now. Seize it. Last night I went to a football game with my new son-in-law. I don’t love that term — son-in-law — and prefer to think of him and address him as, “Son,” but the “in-law” part does serve to clarify. We saw the Montreal Alouettes eek out a probably undeserved win over the Ottawa Renegades. For those who don’t know, I am speaking of Canadian football as opposed to what is called football in most of the world but what we call soccer. Canadian football is almost identical to American football. You can easily adapt from the one version to the other as there are downs, touchdowns, field goals, passing, rushing, blocking, and tackling. The differences are minor in a sense but affect the tenor of the game. With a slightly wider and longer field and only three downs, it tends to be more of a wide-open game because if you only gain three yards on a rush, you only have one more chance, not two as in the US version, to gain the next seven yards. Therefore, you’re less likely to content yourself with another three-yard plunge into the line. That’s just a little background-filler and not particularly newsworthy. What does arrest my attention is the realization that I saw my last and only live, pro football game before my son-in-law was born. I was younger then than he is now. A meaningless piece of information in a sense, but little realizations like that bring me up sharp. Although meaningless on one hand, they seem terribly significant in some almost indefinable way on the other hand: poignant and important in a sense that I cannot readily explain. This whole aging-business continues to surprise me. Although I inhabit the body of a man who now lives at the far side of that broad expanse of life that we label as middle-age, I am more that whom I chronologically appear to be, for I am not only this age, but I am all ages. There are many me’s all jumbled together into one package that has a single one-dimensional façade to others: for example, my offspring who know me well but, in a sense, not at all. In an instant my thoughts slide from those of a child to those of a gaffer. It’s not even really just that: not just my thoughts shifting randomly. In a very real sense I am the child, the teen, the young adult, the forty-something, the sliding-into-sixty me. I do not just recollect a thought, feeling, or impression from back then, but I am back then: back then as if no time whatsoever had elapsed. For that instant, I again become the ten-year-old or whatever age-track to which that my memory disc spins and rests at that moment. I am not explaining this very well, and my family whom I am visiting are bestirring, and it is time to visit with those loved ones whom I see all too infrequently. It’s okay; I am only beginning to explore the topic, only beginning to worry at its edges. If you are of an age, of course, you know whereof I speak and can probably articulate my jumbled musings better than I can this morning. If you are not of such an age, you probably cannot begin to comprehend this babble on any account although I would at least hope that you are aware that I am attempting to communicate something about time and life and that there is a new experience awaiting you.